Tuesday April 3rd young 3 year old Gabriel Negreiff complained of abdominal pain and nausea. Brooke and Mike never imagined when they took him to emerge in Trail they would be flying to children's hospital in Vancouver leaving there two twin boys Coleman and Graysen with their grandparents to deal with Gabriel's cancer diagnosis of a Wilms tumour on his kidney. 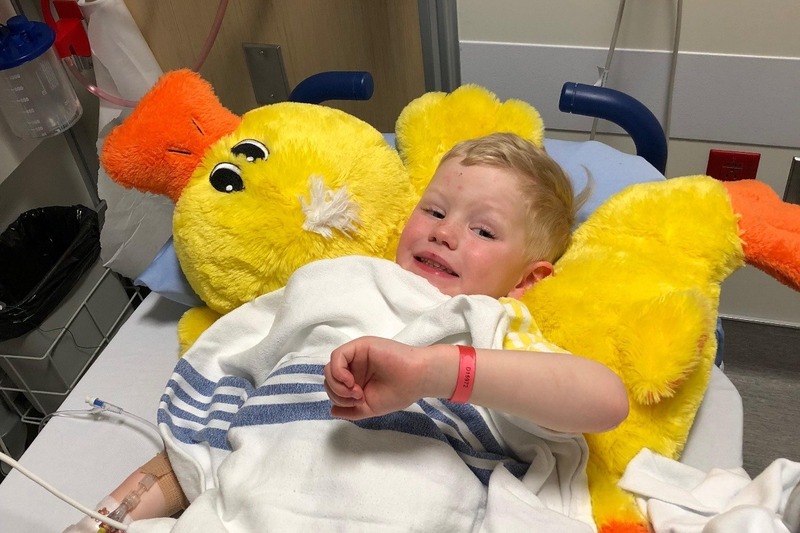 Once in Vancouver the tumour continued to cause internal bleeding which expidited the need for an emergent removal of Gabriel's right kidney and tumour late Wednesday night. This family and young Gabriel are embarking on a long journey of both radiation and chemotherapy to beat this cancer. Please help support the Negreiff family while they face the emotional and financial journey ahead of them. All money raised from this years wooden bat tournament will help aid in Gabe's journey. If you have never played in a Wooden Bat tourney, it is well worth trying once. This tourney isn't like Sunfest or Windup... it's one that is laid back, we get to play ball in September, do some good and have fun. It's a great way to end the ball season. This year is especially important to us as we will be helping out the Negreiff family with young Gabe's fight with cancer. Mike and Brooke and the boys are part of the Maulers family and part of the ball community. We are still accepting entries until September 10th. Contact us by email (castlegarslopitch@hotmail.com) to enter today. I wanted update you all on Gabe’s status and reach out for any assistance available. A recent CT Scan has shown that Gabriel no longer has metastatic disease to his lungs. He will continue to receive treatment for a total of 33 weeks. Today is the start of week 13. Although the Negreiff family are very grateful for this amazing news, their financial burden of living away from home will continue until atleast the end of December. Mike and the twins have joined Gabe and Brooke in Vancouver and they are all staying at the Ronald Mcdonald house. They are so grateful to everyone for all of the support they have received thus far both financially and emotionally. Please help me to continue to support this loving family. Gabe was discharged from Vancouver children's hospital yesterday afternoon and is now staying at the Easter Seals house near by while he continues his radiation and chemotherapy for the next few months. Thank you to everyone who continues to share Gabes story and support this family! God bless! Gabriel's recovery from his nephrectomy was longer than expected but he has turned the corner and is recovering well. He will start his radiation this week and his chemotherapy will follow. He has a long journey ahead of him but hopefully the worst is behind him. Thank you to everyone who has helped support Gabriel and his family! We have heard from a few people who want to help but are unable to use the go fund me page so we have opened an account for donations at any Kootenay Savings Credit Union Branch under the name Gabriel Negreiff. Again thank you for your support and God bless!